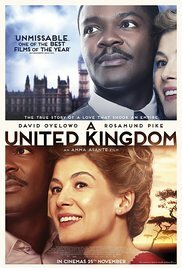 The film is based on the true story of the heir to the throne of Bechuanaland, Seretse Khama (Oyelowo) of the Bamangwato tribe, who studies law in London immediately after World War II. There he meets a White woman, Ruth Williams (Pike), whom he eventually marries, despite the protests of both their families and opposition from the British government, which is concerned about relations with South Africa and the stability of the entire region of Southern Africa. Read more on Wikipedia.